The Norco Sight Carbon Forma was the most polarizing bike in the women's test, eliciting a different opinion from each rider. But one assessment was consistent–when pointed downhill, this bike rules. With 5.5 inches of front and rear travel, the all-mountain Sight was one of the burliest bikes of the bunch and its brawn shined in aggressive terrain. This is likely due to its smart geometry: a relatively slack 67.5-degree headtube angle, low 13.3-inch bottom bracket and short 16.8-inch chainstays. But it was difficult not to get distracted on fast descents by a constant chain rattling since the rear derailleur oddly doesn't have a clutch. Also, one tester flatted and lamented the lack of a quick release on the rear thru-axle. We were being too picky? Perhaps, but it's often these small details that make a big difference. The Sight climbs well for its build, but at times felt sluggish in tight, technical terrain. 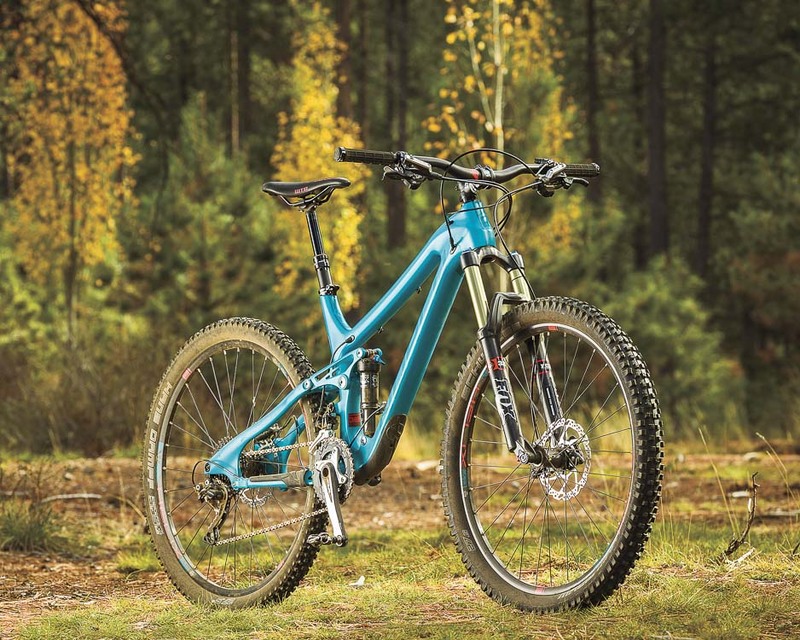 At 44.5 inches, the wheelbase was on the longer side compared to some of the other bikes on test–longer than both 29ers–so surely that contributed to its less nimble feel. For the price, the Sight is well-dressed with Fox Float Performance CTD front and rear suspension, Shimano SLX brakes that stop on generous 180-millimeter rotors, a RockShox Reverb dropper post, comfortably wide 740-millimeter Norco aluminum bars and Shimano XT front and rear derailleur. A single-ring setup seems more appropriate for this bike, and Norco does offer a one-by on the Sight C 7.2, but that model does not come in the women's-specific 'Forma' option. Not that there's much difference between the two. Norco doesn't make 'women's-specific' bikes, but builds existing frames with parts that are perceived to be more female-friendly. In this case, that means a different frame color, a 20-millimeter shorter handlebar, thin-design lock-on grips and a WTB Deva saddle. We had questions about the new bikes before we even got our test rigs, so we sent out a few queries—the kind of things we thought you might be asking yourself when you're looking at this bike. Then we sent out another round of asks if any major questions or issues came up during testing. Here's the feedback we received from Norco marketing manager, Chris Cook. VERNON FELTON: Who's the ideal rider for the Sight Carbon Forma? CHRIS COOK: The Sight Forma rider is a woman who lives for adventure by bike and challenge her limits. The destination for this rider is only limited by their imagination, and whatever the terrain in between is a part of the adventure. The Sight Forma is as comfortable on a steep technical climb as it is on a mountain traverse or catching some air on a long, flowing or even fairly steep decents. The Sight Forma is a woman's ticket to seriously fun adventures in the mountains. VF: So the Sight Carbon Forma is running the identical frame as the men's version (same geo, at least). Am I correct in stating that the things that make it "women's specific" are the cockpit components? CC: The Sight Forma takes the touch points into consideration to ensure the perfect fit for a woman. Utilizing a women¹s specific saddle, narrow handlebars, thin grips, shorter cranks and a custom graphic design the needs of a female cyclist are exceeded. VF: Some people would argue that a woman's specific bike should incorporate an entirely different frame (for a given model) than the male version. Other folks argue that the frames should be the same and that it’s the component choice that matters. It would appear that Norco is in the latter group. If I've characterized that correctly, what's Norco's official reasoning/position on how to best make a women's-specific bike? CC: Norco is a Canadian, rider-driven company and we believe in making bikes that fit cyclists. The goal is to create the optimum riding characteristics and ride quality for every intended use for the wide range of topography, surfaces and environmental conditions. With the backyard we enjoy here in Canada, it provides an incredible testing ground for all our bikes, and we make the most if it. The needs of men and women in a performance mountain bike are not all that different, and through spec changes in suspension and contact points on the bike we work to exceed the expectations of all cyclists wherever they ride, regardless of gender. By using the same frame we meet all of our goals for fit and performance, while also keeping costs in check for consumers.